Microsoft is breaking away from Internet Explorer with the upcoming release of Windows 10 — well mostly. Windows 10 will ship with the new Edge browser preinstalled, which is nearly an entire rebuild of IE. IE has been around forever it seems and it has been collecting a lot of baggage over the years for the sake of backwards compatibility. This has made the application bloated and slow compared to other modern browsers like Chrome, Safari, and Firefox. Microsoft says they are done. Edge is the proof. Edge is a fast clean browser designed for what Microsoft says is interoperability. In the past they focused only on standard compatibility which according to them made it difficult to support the ever-growing set of web technologies. Microsoft has trimmed huge legacy portions of code from the browser and removed support for features that have been a part of IE for a very long time. One major technology they have removed is support for something called ActiveX which allowed developers to add Windows application features to web pages. Many enterprise applications have relied on ActiveX to develop the web based applications many of their employees use every day. Edge is going to be a stumbling block to Windows 10 adoption…or is it? On January 12, 2016 Microsoft will stop supporting IE 8, 9, and 10. IE 11 will still be supported; however, security updates will be the only active development done for the browser. This means IE 11 will be available for Windows 10, giving ActiveX users and users of many of the other technologies Microsoft has cut from the feature list of Edge a bridge, which will enable the migration to the new operating system. In an article I read recently, the latest build of Edge ran twice as fast as IE 11 and also beat beta builds of the latest versions of Chrome and Firefox. The look and feel of Edge is more simplified. Microsoft calls it immersive. They have stripped away a lot of the menus and menu bars filled with add-ins, taking the webpage nearly to the very edge of the screen. Edge includes support for Cortana, so she knows and understands your web browsing habits and interests. You can add notes to any page and even write and draw on a page with a touch screen. These notes are saved to the computer and reappear when you return to the page later. You can even share the notes with other Edge users. And the final big feature is one that other browsers like Chrome have supported for a long time and that is extensions. Extensions are programs that can be added to the browser that can be used to customize how certain pages are viewed and add functionality to sites like Reddit for example. This feature isn’t part of the initial release but will be added via an update after the release. Why is this new browser so important? Well the browser we use is generally out interfaced with our cloud applications and the experience we have with those apps and services is largely dependent on the functionality the browser supports. IE is one of the most used browsers on the planet and when things change with IE it is like there is , to borrow a quote for a movie, “a great disturbance in the Force.” The effects of these changes are felt far and wide by users, developers, and IT departments as they scramble to find solutions and workarounds to keep everything running, until they can figure out how to work with the change. I love technology. I surround myself with it every day. So far this year we have been given a look at what I think is the coolest advancement in virtual and augmented reality in the form of HoloLens from Microsoft. Computers have gotten smaller and what amounts to the latest iPhone/iPad fits on your wrist. Wearable technology is starting to blend the use of technology into the background of our lives. There is still a problem of technology getting in the way of our lives and how we interact socially, but I feel like that is going to fade as we learn to manage and consume information and entertainment in different ways. Technologies like computer vision and gesture recognition as well as voice activated digital assistants are allowing us to interact with technology and the virtual world in new and different ways that are more like how we as humans interact with each other. It has been a long road to get to where we are today with technology and there is still a long way to go before we reach many of the goals the dreamers of science fiction have set for us. I sometimes like to take an outside-looking-in view of all the technology and it gives me perspective — on how technology has changed and how it has changed the average person. 30 years ago the image of bald men in thick glasses wearing lab coats was the stereotype when someone was talking about computer technology. Today technology is approachable by people from all different disciplines. This has given rise to computer technology not only being functional in more ways than anyone could have imagined 30 years ago but it is also being more aesthetically pleasing, allowing it to blend into our everyday lives. It amazes me how comfortable my kids are with technology. My kids are curious and are always asking me questions, quite often questions to which I don’t have the answers. When I don’t know the answer they say, “Well Dad, let’s search it on the Internet or ask Siri and see if she knows.” They are never far away from the information and the content that they want and I see how it is able to augment their learning and interaction with others in ways I would sometimes never even think of. I hope that the articles that I share with you all each month are informative and useful and serve to perhaps in some cases spark your interest in technology not only for your business but in your personal life. Technology is a part of who we as a society are becoming and I hope everyone finds something they love and enjoy about technology or perhaps how it improves or augments the things they enjoy in life. I would like to hear back from you about your favorite app or gadget or some piece of technology that you are using to augment a hobby or other interests you have that maybe just a few years ago you never would have dreamed would have existed. Visit our Facebook page at http://www.facebook/JacobsCompanyBITS and share your comments. I have been doing professional IT consulting since early 2000. When I started supporting small businesses most of them had a computer or 2 and they used a dial up modem to connect to the Internet. I came into the industry just as computer networks really started to be on the small business radar. A few businesses had Windows NT servers or even Novell, but most did not. Many of the businesses I visited used coax networks and hadn’t made the transition to Ethernet based networks yet. I remember very distinctly this being the time when Microsoft and a few others in the IT world really started to look at small business and see that there was a need for technology that would allow them to compete with large enterprises. Microsoft launched a “first server” campaign with Small Business Server which was a huge catalyst for bringing major change to the way small businesses used technology. There was a problem though — small businesses had no experience building networks and decisions were made not strategically and with the future in mind but because an immediate need forced them. As Ethernet became popular, switches were put in cabinets or on shelves, generally close to the server or a person’s computer that doubled as the “server.” As the need grew for servers, they were tucked where ever they could go. Servers were stuck under desks, in closets, storage rooms, next to boilers, or in damp basements. None of these places were designed to accommodate the needs of the very expensive networking equipment that in just a few short years all of these small companies have staked business on and rely on for nearly every aspect of their daily operation. 15 years later this equipment is still being relegated to whatever dark corner it can be hidden. It is time to change the way you look at your network and your servers and move this equipment into an environment where it has a chance of working for you longer and with more efficiency. Server rooms and network closets have 2 basic requirements: power and temperature managements. The network equipment can draw a lot of power and is vulnerable to outages due to blown breakers as well as surges and sags in the current that is being provided to them. A server closet should have at least one dedicated circuit on its own breaker that is capable of supporting the power requirements of your equipment. Depending on the amount of equipment more than one circuit may be needed. Call an electrician to make this happen, but make sure they understand what you are trying to accomplish. It is usually a good idea to let them chat with your IT consultant to make sure everyone is on the same page. Don’t let your electrician go just yet because they might need to supply additional power to run some air conditioning equipment. All your equipment has a rating for operating on both hot and cold temperatures. Operating above or below those tolerances can be quite destructive to the electronics inside. Most equipment has a rating for how much heat it gives off under average operating conditions, usually listed in BTUs. Adding these up for all your equipment will tell you and someone familiar with heating and cooling like an HVAC contractor how much extra cooling will be needed for the room or closet. In many cases, a standalone unit is needed to provide the cooling power needed to fight the BTUs the equipment is radiating. Let’s talk location. Your equipment doesn’t really care where it is. It doesn’t aspire to a corner office, but there are a few things you should have and a few you should try and avoid. Water is a big thing you want to stay away from. If your equipment is in a basement try and make sure it is away from any water pipes or hot water tanks. Also, if the basement is prone to flooding or is damp/humid you should avoid this as a good place to have your equipment. Small closets are not the best because they trap heat, so if you are using a closet make sure you plan for exceptional ventilation and airflow. The optimum location for your equipment is some place central to all the other devices that will be connecting to it. This location should be away from exterior doors and windows to help prevent the weather from getting in. There should be enough room for all of the equipment to be easily accessible. The area should have a door with a lock, because we don’t want anyone just walking in and accessing the server and equipment where all of your employee’s and clients’ personal information is stored. Finally, remember the power and cooling we talked about earlier? It needs to be some place where these needs can be met with minimum difficulty. If you haven’t updated your cabling since 2003 now is probably a good time. Cat6 cabling is inexpensive and provides excellent support for fast gigabit data speeds. When pulling your new cable, bring it all to a central location like patch panels in a rack, which allows for organization that can aid in trouble- shooting later. If properly bundled it also improves airflow and reduces the amount of heat trapped in the room or closet. 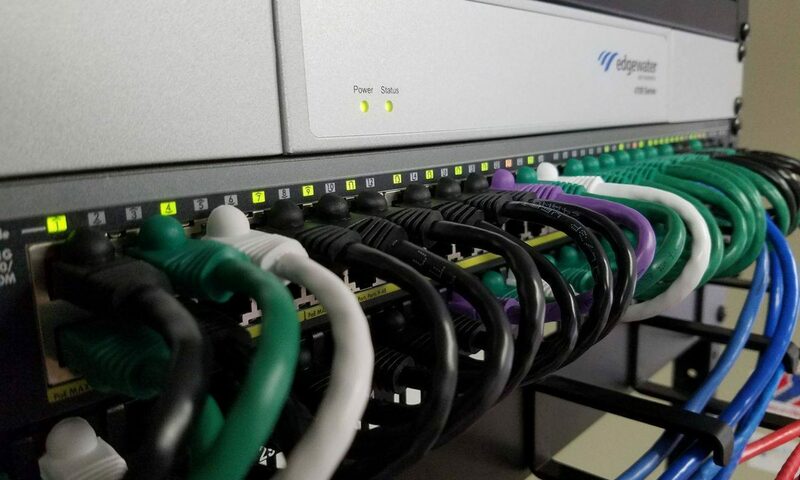 Most switches are designed to be placed in racks, so mounting your switches in a rack above or below the patch panel is pretty straight forward. When you start looking at racks you have to decide what you plan on placing in the racks and if you think there is a possibility your network might grow. Experience from the last 15 years tells me yes network growth is certain, but I asked a Magic 8 Ball to be sure and it answered “Signs point to yes!” A wall mount rack is good for switches and patch panels; however, if you are considering purchasing a rack mount server to replace that old Windows Server 2003 that is going out of support then a free standing 4 post rack is probably your best bet. You just need to be sure you have enough space for your current equipment and some room to grow. I have another article in this newsletter talking about backup power, but I want to touch on it again here briefly. When planning a server room or closet make sure you include planning for battery backup and generator power. Batteries generate heat just like the other equipment in the room so they should be included in the calculation. Depending on the size and type of battery you choose they can be mounted to the wall, placed on the floor or even placed in the rack as the power distribution point for the devices mounted in the rack, so make sure you have room for it and perhaps extra batteries and backups as your needs grow. Small businesses rely on the networks they have pieced together over time and by-and-large they have served their purpose well. The more we depend on our networks the more important it becomes to have a properly designed network and server room/data center to maintain the efficiency of that technology. I am not recommending everyone start remodeling their offices in favor of adding a datacenter. I am recommending however you take a look at where your equipment is located and begin planning on improving the environment in which it works with an eye towards achieving all the things I have mentioned in this article. The network is no longer a red-headed step-child hid away in the basement but the heart of how you do business, and it is an excellent time to start changing the way it is treated, to begin thinking of it as a core part of the business and a strategic tool to improve the way the business operates. I have been giving a lot of thought lately to the data that is stored on the servers here in my office and data stored on my client’s servers as well. The traditional client server model is fine. There is nothing wrong with it except that it poses certain limitations when providing access to information outside the office. More and more business and the work done in the service of that business is being done everywhere but in the office. The cloud is the perfect tool to leverage for making this transition. But when you think about how that data will be used and accessed both in and out of the office and how to protect it and manage who can access it complications arise. Cloud storage is great. It is cheap and secure, but how do you access it. In many instances you need an additional application or you need to create one of your own. The idea of a cloud file server that matches 1 to 1 with the way we use our local file servers seems to be lost. But in taking a step back and looking at this from different angles maybe traditional file server ideology shouldn’t be what we should be looking for in the cloud. I am a big fan of Active Directory (AD) and the security and manageability it affords network administrators. AD gives us the tools to secure the network and the data within. A single password and user ID is all we need to unlock everything we need to do our work in the office. But what about outside the office. This is where the idea of integrating Single Sign On (SSO) provides an opportunity to make life easier for network administrators to integrate cloud services like Box.com into the security umbrella of AD. Box.com as an example supports SSO integrating with AD allowing you to link box accounts to network user accounts so they sign on to both systems with the same credentials. Employees rejoice! You don’t have to remember another password. I use box.com as an example because once you get rolling it has the most in common with a file server. You can create shared groups of folders, attach and sync them to local hard drives on employees’ computers as folders or mapped drives. Plus, a non-technical employee could probably set it up with a minimum of support from the folks at box.com. “But Brian,” you ask, “what about office 365?” Well yes, of course, you have integration with local AD. I think however that setting up features like these at this point in Office 365 are still a little difficult, so if you want to go with what is certainly an extremely powerful solution make sure you have your IT consultant handy along the path of planning and implementation. We can get everyone connected, but now what should we store on the cloud? Well, it depends on what you need. There are a lot of files on your servers that I am sure haven’t been opened since you installed your first server. While it would be nice to access these on a whim from anywhere in the world you probably don’t really need to do that. There are probably records that just by their very nature should be left to continue maturing inside your local server until such time they might be needed. Things you are actively working on or that you might be referencing in the future — those are your documents you want in the cloud. Say you are an architecture firm and your structural engineer had to take some time off in the middle of a big project. Well, if your drawings and docs related to the project are all in the cloud you can call him up and ask him to review the latest changes to make sure the structure isn’t going to fall over with the first storm that passes through. He just logs into the cloud with his work user name and password and nobody misses a beat. When a project is done it loses relevancy and value very quickly so it doesn’t make sense to keep it at the crux of your active data. Move it back to your local file server for archival or better yet place it in some form of bulk cloud storage for retention. Super sensitive data or large files that you need to be able to open quickly will always have a place on the high performance local network, but for most of the stuff you work on regularly the Cloud is the place for your business . If you think moving to the Cloud is the next big technology step your business is going to take then it is of the utmost importance that you plan on exactly how you will leverage the Cloud and how you will educate your employees to use it. Cloud technology is still new. Most of your older employees might have an idea about using it but they are going to need guidance, because it is unlike anything they have used at work before. Your 20-something new hires are going to have a different outlook. They will be very comfortable using the cloud and in many respects expect it to be a tool at their disposal. Like what I saw in the early 2000’s with servers making their mark on the small business network, the cloud technology of the Internet is here and it is time you began looking at how you can use it to improve the way you do business. I am excited and more than looking forward to the arrival of summer weather, but an individual calling my office recently reminded me that along with summer comes the summer storm season. Summer storms that blow in in the spring and summer can be unpredictable, ranging from a light sprinkle to raging torrents that bring lightning, wind, and destruction in their wake. This destruction can also bring power outages. Storms aren’t the only cause of power outages in the summer though. Air-conditioning draws huge amounts of power which coupled with high temperatures can put a lot of stress on the power grid. This stress can manifest in outages or just as damaging to electronic components, sags, also known as brown-outs. No doubt you have taken steps to protect your network equipment like your servers, switches, and routers from these power conditions. Maybe you have even taken steps to protect your computers. This protection I am talking about of course is battery backup. A good battery backup will protect you from both spikes and sags as well as provide you with time to properly shut off your equipment when power is lost completely. This extra time is crucial in protecting data and system files from corruption that can occur when devices on your network just shut down. A battery backup however is only as good as the battery inside the UPS. If the battery is bad your battery backup might not provide you with the protection you expect. The batteries inside a UPS are basically car batteries, and similar to car batteries they are being fed a charge almost constantly. We want this because we want the greatest charge possible on our batteries when disaster strikes. This constant flow of incoming charge along with the natural chemistry of a battery can cause it to become weak over time. Eventually, just like your car battery, they need to be replaced. Many UPS manufacturers have special charge circuits they have developed that can improve the life of a battery as well as detect when it begins to get weak. The UPS manufacturers like APC still recommend you test and service you battery backup regularly. Most UPS batteries last anywhere from 3-5 years before they show signs of getting weak. It is a good idea to test your backup annually, much like your backup strategy. Most modern UPS that fall into a range I would consider “smart” have a test button that will test the health of the battery. I think though the best test is to stage a test outage where you evaluate if the battery backup is able to provide the expected amount of uptime and if it is sufficient to shut down your systems safely in a real power outage scenario. Before I conclude I just want to remind you that a battery only runs for so long. If you need to continue working past the time, a battery backup solution that can provide a generator is a perfect addition to an IT disaster recovery plan. Your battery backup in this scenario provides you a bridge of power until you are able to get the generator running or it kicks in automatically. The batteries also help to smooth out the power from the generator which can fluctuate quite a bit. A new season of potentially drastic weather is coming, and your business should be prepared. A good friend of mine owns a dance studio. I like to mix music, so I create custom mixes for many of the numbers the studio does for recitals, competitions, and public exhibitions. Over the years, the studio owner has amassed a huge collection of music both off the shelf and custom mixes. Managing that music has become a problem, and as the studio has grown, making sure teachers and helpers have access to the music they need to run classes has become difficult. Since I know a little something about managing and sharing data I decided I would help him out. Here is the solution so far. A low cost mini desktop computer with iTunes is at the heart of the solution. We added an external hard drive to store all the music on. Home Sharing lets us share all the music that is cataloged in the iTunes software. Playlists can also be created on the machine and shared so that helpers can find a playlist for the class and have all the music organized and together for a specific class. After you turn on Home Sharing in iTunes you have to add the Apple ID used for Home Sharing to the music settings on the iOS device. This allows the device to access the content stored on the computer’s iTunes library. A Netgear wireless router provides the wireless network connection for all of the devices so they can access the iTunes Home sharing service on the PC. The router also connects the PC and the mobile devices to the Internet. This is the bulk of the set up and is fairly straight forward. We also need to be able to update the songs on the PC when custom mixes are completed. We have been using Microsoft OneDrive for a long time for basically all of our remote requirements so it was an easy decision to continue using it. We store all the current dance season’s music on OneDrive. This allows me to sync all the custom mixes between my computer and the cloud as well as back to the studio computer. Once a song is synced back to the studio computer we can add it to iTunes, making it instantly available to the teachers on their iOS devices. Because the song is still in its original location it remains synced with the cloud, allowing us to also access all of the current year’s music from any mobile device using the OneDrive app or a web browser. The solution is almost completely wireless. The only wires required are stereo aux cables that are used to connect the iOS devices to the speakers. In the future though adding airplay capabilities to the speaker system or adding Bluetooth receivers will allow the audio to be sent to the speakers wirelessly. This isn’t a requirement for the solution but might be useful in the future. This solution with the airplay or Bluetooth speakers could be duplicated at home in multiple rooms or outside on a patio, allowing you to control and play music wirelessly anywhere in your home. I cannot deny that the Apple Watch is an amazing little piece of technology. This little computer succeeds in pulling the most common notification and response tasks from our phone and setting them squarely on our wrist. A tract of personal real estate whose sole tenant was once jewelry or the now classic and somewhat antique watch. The Apple Watch and other wearables have succeeded in making a standard watch obsolete, but the Apple Watch goes a step further and tries to take the place of other fashion accessories with its beautiful design and gold bands. The I watch has what is truly an imaginative new user interface that uses the crown as a dial for selecting and scrolling and a screen that is not only touch sensitive but pressure sensitive as well. You can check the time of course, but you can also check your appointments, see who is calling, and respond to Facebook or twitter notifications. The Apple Watch is also a health sensor as well, collecting heart rate and activity levels to store in the Health App. If you like you can even send your heart beat to that special someone who can see and feel it on their own Apple Watch. So is the Apple Watch worth it? The little device starts at $549 and goes to $1,099 for the Apple Watch “Edition” which is the premium luxury car model of the Apple Watch. I say constantly that apps are what make a smart phone useful. I believe the same will hold true for the wearable class device. Initially, smartphones were digital assistants that let you make phone calls. Tablets where glorified smartphones that didn’t let you make phone calls. What they have in common is they were designed for viewing and consuming media. Another thing they have in common is today we input almost as much data using these devices as we do on a desktop or laptop. The Apple Watch and other wearables have arrived to fill that little void for a device that we use solely for quick bite-sized media consumption. There are already a number of apps available for the Apple Watch that let you map fitness activities, pay for your ice cream afterwards with Apple Pay, and even open you hotel room door. If we base usefulness of the device solely on the apps that are available today then yes for many, not all, people the features make the Apple Watch entirely worth the $549 price tag. The jury is still out on the “Edition” pricing. Over $1,000 for a watch seems a bit outlandish to me. One of the biggest features of the Apple Watch is its fashion flexibility. There are 2 different sizes, 5 different metals, and 6 different bands from which to choose, allowing you to match your Apple Watch to any outfit, for any occasion. For all of the things this little device does, Apple is claiming an average 18 hour battery life. For a device with a color touch screen I find that fairly impressive. Nightly charging of the Apple Watch is done using a magnetic connector that attaches to the back of the watch and “wirelessly” charges the battery. Your night stand just got a little more crowded, and so did that surge strip you had to get to accommodate all the devices you charge next to your bed at night! I think the Apple Watch is a fabulous device though it is way too expensive for the current perceived value and the personal real estate it wants to call home. I will wait and save my pennies for maybe the version 2 or 3, and hope for an even lower priced version in the future. OneNote is one of the coolest Office apps that gets very little attention from users. Most people don’t have a clue what it is, or what it does, or even how to use it. Be warned — once you start using it you will be addicted! What is OneNote? If you are like most people, whenever you need to take a quick note about something you want to remember or you need to take notes in a meeting the first thing that comes to mind is to grab one of those yellow pads of paper and start writing away. OneNote is an electronic version of that yellow notepad…and so much more. OneNote is a binder and organizer in addition to a notepad all rolled into a single application. OneNote lets you take notes and organize them by pages, sections, and notebooks. OneNote lets you clip images and add them to a page. Because OneNote is part of Office you can pull in objects from other Microsoft applications, like a chart from an Excel workbook. OneNote notebooks are searchable, even the hand written text. OneNote supports natural handwriting. Using a Windows Surface tablet and stylus, OneNote has near perfect palm blocking allowing you to rest your hand on the screen as you write just like you would a piece of paper. OneNote can recognize handwriting so that search I was telling you about is able to also search your freeform handwritten notes. Handwriting can be selected and converted to typed text with a push of a button, so translating your notes to a typed document becomes a matter of a little cleanup instead of completely re-typing your notes. Handwriting is by far one of my favorite features of OneNote. Until recently you could only really use handwriting on a few devices like the Surface Pro or a computer with a digitizer. Recently, Microsoft updated the iPad version of OneNote to support handwriting and palm detection/blocking for a natural writing feel. According to Microsoft blogs similar features are coming to the Android app in the near future. In addition to handwriting recognition and being able to use digital ink on the iPad, Microsoft also added the ability to recognize and search text within an image from any notebook saved on OneDrive with any OneNote app available today. OneNote is included as part of Office and Office 365. For a long time now OneNote apps have been available free on mobile devices with some limited functionality, though new features are being added all the time. Last year the full OneNote desktop software became a free tool available to everyone, but with a few feature restrictions. Recently, the free desktop version became “even more free.” Microsoft announced that they are removing all feature restrictions from the free edition of OneNote 2013. I use OneNote on my Surface Pro constantly to jot down thoughts and ideas, sketch out network layouts, and even take notes in meetings. I am beginning to use it more on my iPad as well now that it supports handwriting, and my wife is even using it to help her organize her 31 parties. If you aren’t using OneNote to organize yourself and your notes I strongly recommend giving it a try today. I am pleased to announce that I am now able to offer 2 new fully managed cloud based security solutions. Managed Antivirus and Managed Backup. With these 2 products I can provide a cost effective way to manage your security from the cloud. Server backups in the cloud can replace tape or other on site backup solutions. All backups are stored in a secure, fully SSAE-16 compliant data center. Configuration is done in the cloud, so once the backup client is installed on the server new backup jobs can be created and existing backup jobs can be monitored without having to be on site or otherwise directly connected to the server. Because your data is backed up to the cloud you no longer have to deal with making sure tapes or drives are changed out nightly and taken home. The threat of a tape or drive being lost and data being stolen from those lost drives is eliminated. In the past, each computer had separate installations of antivirus installed and managing each installation had to be done separately. Each machine had to be checked individually to make sure the software and definitions where up-to-date. If you had 5 or more machines you might have a server that could centralize this antivirus management; however, monitoring and maintaining this server required someone to physically manage the server and in most cases this extra software was installed on the only server in the office using valuable storage and other resources. Now I can offer an alternative. Cloud managed Antivirus based on antivirus technology from McAfee. Machines protected by the managed antivirus get their updates from the internet whenever they are connected. The antivirus client reports to a cloud based management server that allows us to monitor the health of each machine and identify issues with managed devices almost in real time. In some instances we might know your machine is being attacked by a virus before you do. Managing backup and antivirus in the cloud is a great first step towards the benefits of having Jacobs and Company B.I.T.S. fully manage your IT. Monthly online backup starts at $25/month for 100GB of storage. For managed antivirus each device covered starts at just $5/month. I have written previously about a problem that myself and many of you have when it comes to using cloud storage solutions. I call it Cloud Storage Sprawl. Cloud Storage Sprawl is when your documents and data become spread out among multiple cloud storage services like OneDrive, Google Drive, Box.com, and Dropbox to name a few. In my previous article, I recommended selecting a set of purpose built cloud services like flicker for pictures and OneDrive for documents and simplifying your portfolio of storage providers. I try to take my own advice as often as possible, but sometimes I fail. Because I test lots of different services I tend to have my data spread out all over the place. Microsoft has embraced that fact that many of you are much like me, with documents on cloud services other than theirs, and they are working to accommodate that. Last November Microsoft partnered with Dropbox, allowing you to add Dropbox as a storage location in Office Desktop Apps. Recently they expanded on that partnership and made it easier to access files stored on Dropbox from iOS apps as well as Office Online, the web browser based version of Office. The Locations Picker in iOS apps is able to integrate natively with several cloud storage provider apps on your device, allowing you to choose to open and save files stored on multiple cloud storage providers’ services. Integration with Universal Apps for Windows 10 and Android based devices is not yet available, but Microsoft says they are hard at work bringing this feature to all of the platforms that Office runs on as part of their cloud first focus for all of their products. As more cloud storage providers update their apps and online services to integrate with the new program interface Microsoft has introduced, you will see more providers showing up as targets to save your documents to from within Microsoft applications. The continued march to the cloud seems to be inevitable. More and more of our data is being stored there and for good reason. It is cheap and, assuming you take steps like using strong passwords, it is more secure than most small business networks. Even though it is continuing to get easier to make use of cloud services for business it is important you take the time to do your due diligence regarding a service and their rights to the data you store on their systems. In some cases, a cloud service agreement gives the service provider more control over your data than you or your customers might feel comfortable. Responsible data management is key to maintaining not only a hold on your data stored in the cloud but also your sanity. I can say with near perfect certainty that I have never had an issue with any of the cloud providers I trust and on more than one occasion their use has saved me not only from disaster but also the occasional bout of forgetfulness when I have left a document behind and needed to use the web to access it.